Each Christian has God’s gift of holy spirit. Therefore, each Christian has spiritual “power” and should be exercising that power. Remember that Jesus said that when holy spirit came, believers would have power. What is the power Jesus was speaking of? It is the power to hear from God, to speak in tongues, prophesy, do signs, miracles, and wonders, and much more. In short, we can bring into evidence, into manifestation, the gift of holy spirit inside us. The gift of holy spirit, the divine nature, that is sealed in each Christian, cannot be detected by the five senses. No one can see, hear, smell, taste, or touch it. 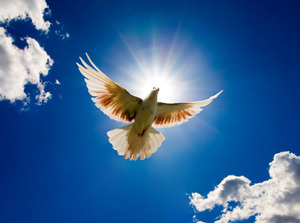 However, holy spirit inside can be manifested, brought forth into evidence, in the nine ways set forth in 1 Corinthians 12:8-10. 1 Corinthians 12:7 Now to each one the manifestation of the Spirit [spirit] is given for the common good. The word “manifestation” is a good translation of the Greek word phanerosis, which means “a manifestation, a making visible or observable.” A manifestation is detectable by the five senses. We experience manifestations all the time. Electric energy in a light bulb is manifested in the form of light and heat. A manifestation of the chicken pox disease is a rash with small pimple-like sores. We cannot see the virus that causes the chicken pox, but we can see the manifestation of the disease. The multipurpose “Swiss Army” knife is a good example of the difference between a gift and a manifestation. The traditional knives have red handles, and many come with two blades (big and little), two screwdrivers (flathead and Phillips), a can opener, an awl, scissors, a file, and a pair of tweezers (nine manifestations!). If you receive one multipurpose knife as a gift, you can use (bring into manifestation) any or all of its implements, and cut, snip, tweeze, etc. The one gift has many manifestations. Similarly, the one gift God gives each believer is holy spirit, which can be manifested in nine ways. The examples of the light bulb, chicken pox, and Swiss Army knife, are intended to show the difference between a gift and a manifestation, and every example has limitations. The examples are intended to make the point that there can be one gift with many manifestations, and when a person has the gift, he has the capacity to manifest it. The gift of holy spirit is not observable or detectable by our five senses. Its presence inside the Christian becomes known when it is manifested, made obvious, in the senses world. It may be obvious only to the one with holy spirit, such as when God gives a message of knowledge to someone, and that message is known only by the one receiving it, but it is obvious in the senses world nonetheless. The Bible says that to “each one” (1 Cor. 12:7) is given the manifestation of the spirit. Each and every Christian can manifest holy spirit because each Christian has holy spirit. We know there are many Christians who have never manifested the gift of holy spirit in a way that they themselves recognize, and this has caused them to doubt that they can. A Christian can manifest holy spirit even if he never has done so. What are the manifestations of holy spirit? The Bible tells us. 1 Corinthians 12:8-10 (8) For to one is given through the spirit a message of wisdom; and to another [allos] a message of knowledge because of the same spirit; (9) to a different one [heteros] faith by the same spirit; and to another [allos] gifts of healings by the one spirit; (10) and to another [allos] working of miracles; to another [allos] prophecy; to another [allos] discerning of spirits; to a different one [heteros] various kinds of tongues; and to another [allos] the interpretation of tongues. We will study each of these manifestations separately, but before we do, we need to address some basics about the manifestations. First, these verses seem to indicate that each Christian gets only one manifestation, something that has confused many Christians. Even though these verses use the term, “to another,” it does not mean that each person will manifest only one of the manifestations. As we have seen somewhat already, and will see in much more detail later, every person can manifest all nine of the manifestations. However, not everyone will manifest the spirit in the same way at any given time and place. To make sure that things in the Church are done “decently and in order” (1 Cor. 14:40-KJV), at any given time the Lord energizes different manifestations in different believers. Thus at a Christian meeting, one person will speak in tongues and interpret, another will prophesy, another will minister healing, etc. It is important to point out that believers need to step out on what the Lord is energizing in them. It often happens that he is working in someone to pray, speak in tongues and interpret, prophesy, etc., but the person will be too timid to step forth and manifest. The Lord will do his part, we need to be sure we are doing ours. Second, the Bible specifically says that the manifestation of holy spirit is for the “common good.” Some benefit is missed, or some consequence occurs when Christians do not walk with the power of the manifestations of holy spirit. Imagine the Bible with no such manifestations—no record of Moses smiting the rock, or Joshua stopping the Jordan River, or Samson pushing down the pagan temple, or God telling Samuel to anoint Saul as king, or Elijah calling down fire from heaven, or God telling Jonah to go to Nineveh. The Bible would be much less exciting, and would bring much less hope and blessing, if the power of God were absent from its pages. If Ananias had not walked in the power of the manifestations, he would not have had the blessing of healing Paul (Acts 9:10-18). If Peter did not walk in the power of the manifestations, he would not have had the blessing of being the first to lead Gentiles into the new birth (Acts 10:9-46). If Paul had not walked in the power of the manifestations, Eutychus would have remained dead (Acts 20:9-12). If a Christian does not speak in tongues, he misses out on the fact that it is a sign from God that he is saved (1 Cor. 14:22).Similarly, if the manifestations are absent or misused, there are consequences. If everyone in the congregation speaks in tongues at the same time, for example, an unbeliever may get the wrong impression (1 Cor. 14: 23). Third, we must take note that God has placed the manifestations into three groups, or categories. In the above verses most versions read “to another” eight times. However, there are actually two different Greek words, allos and heteros, translated “to another.” In Greek, allos was generally used to express a numerical difference and denotes “another of the same sort,” while heteros means a qualitative difference and denotes “another of a different sort.” When a list is put together, and the items are said to be allos, they are of the same kind or nature. When they are said to be heteros, they are different in nature. Thus what we see in this section is God separating the manifestations into three groups, separated by the word heteros, which we showed in brackets when we quoted the verses. In our translation, we used “another” when the Greek word was allos, and “different one” when it was heteros. As we study the groupings of the manifestations, it is clear that two of them are revelation (hearing from God), five are related to the power of God, and two are worship oriented. The manifestations in the category of Revelation are: A message of knowledge, A message of wisdom. The manifestations in the category of Power are: Faith, Gifts of healings, Miracles, Prophecy, Discerning of spirits. The manifestations in the category of worship are: Speaking in tongues and Interpretation of tongues. Before we examine these manifestations separately, we need to be aware that they are listed separately in the Bible and discussed separately in this book for the sake of clarity. God never intended them to be separate and distinct in the lives of the believers who experience them. He is our Father and He wants a relationship with us, and He wants us to be effective fellow-workers with Him (1 Cor. 3:9). In order to do that, we must be able to worship God (the worship group), hear from Him (the revelation group), and work for Him (the power group). In the day-to-day life of a believer who is striving to love God, live a holy life, and do God’s will, the manifestations will often work seamlessly and result in great blessing for the believer and the people affected. For example, a Christian woman, Susan, may be by herself enjoying worshipping God by singing in tongues to some Christian music she is playing. Then the phone rings and it is her friend who needs prayer because many things seem to be going wrong in her life and today she is sick. Susan immediately feels the leading of the Lord to pray for specifics about her friend’s life (the revelation manifestations at work) and then commands healing to take place in the name of Jesus Christ (faith and healing). By the time she gets off the phone, her friend is feeling better. In the above scenario, Susan did not think to herself, “Now I need a message of knowledge. Now I need a message of wisdom. Now I need faith. Now I need the manifestation of gifts of healings.” No, she had a relationship with God and love for her friend, and the manifestations worked together to produce the “common good” mentioned in 1 Corinthians 12:7. The manifestations work together, but it is still important to understand them individually. For years scholars have discussed the manifestations of holy spirit, and there are many differing opinions. The reason for the discussion and the uncertainty is that the manifestations are not clearly defined in 1 Corinthians. There is a good reason for this. It is common in all writing that authors leave out details and descriptions that everyone knows. Books and magazines are full of words that refer to things that in other cultures or ages may not be understood. Writers today commonly mention cars, planes, the Internet, and thousands of other things that we do not explain in detail because the readers know what they are. There are many examples of this in the Bible also. A good example occurs in Luke, where Luke did, in his day, a good job of dating the birth of Christ by telling us it was about the time of the first census that took place while Quirinius was governor of Syria (Luke 2:2). No doubt everyone in Luke’s day who read that said, “Ah, now I know when the birth of Christ occurred.” Today, however, not much information about Quirinius has survived the centuries, and so there is controversy about the date of the birth of Christ. Another example involves biblical animals. No doubt when Job was written, everyone knew what the “behemoth” was (Job 40:15). Today we do not know enough information for scholars to agree on what the animal is. Another example involves nations. Genesis and other books of the Bible mention the “Hittites” (Gen. 10:15), but that nation was lost in history so completely that until the nineteenth century, when archaeologists uncovered entire Hittite cities, some scholars even doubted their existence. Nevertheless, the Bible never describes them because the biblical readers knew exactly who they were and where they lived. The people of Corinth and other Christians in the first century were familiar with the manifestations of holy spirit, so there was no need for Paul to explain what they were or how they worked. God’s people had been manifesting holy spirit for generations (except for speaking in tongues and interpretation of tongues, with which the Corinthian Church was very familiar). God had put holy spirit upon people in the Old Testament such as Moses, Joshua, Deborah, David, Elijah, and many others, and those people could then hear knowledge or wisdom from God (thus, the message of knowledge and wisdom). They had the faith to do what God asked of them even when it seemed impossible, they did miracles, and when Jesus came on the scene, he taught his disciples to heal and cast out demons. The believers of Corinth were familiar with all these manifestations, and of course Paul, who founded the Church in Corinth on his second missionary journey (Acts 18:1-18), had also instructed them. Some scholars have tried to look in Greek culture to find the meaning of the manifestations based on the definitions of the Greek words themselves (for example, “wisdom” was very important in the Greek culture). That misses the point, and for the most part has been unhelpful in discovering the nature of the manifestations, and is one reason why there is so much debate about the manifestations by scholars. The manifestations were not Greek experiences or concepts, but the timeless manifestations, outward evidences, of the inward presence of holy spirit. These manifestations were not to be found in Greek culture, vocabulary, or history, but in the experiences of the men and women of God. English culture today is somewhat similar to the Greek culture in that there has been very little accurate exposure to the power of holy spirit and very little accurate teaching on it. Therefore, we need a clear explanation of the manifestations so we can understand them. As the Greeks of old, we need to get our understanding from the Bible itself and then add to our understanding by utilizing and experiencing the manifestations. We will start our study of the manifestations by giving a basic definition for each of them, and then examining them in more detail. A message of knowledge is God or the Lord Jesus Christ providing to you information, insight, and understanding about something. A message of wisdom is God or the Lord Jesus Christ providing to you direction, or how to apply the knowledge you have about something. The manifestation of gifts of healings is you exercising your God-given spiritual ability to heal by the power of God, according to what God or the Lord Jesus Christ has revealed to you by a message of knowledge or a message of wisdom. The manifestation of working of miracles is you exercising your God-given spiritual ability to do miracles by the power of God, according to what God or the Lord Jesus Christ has revealed to you by a message of knowledge or a message of wisdom. Discerning of spirits is God or the Lord Jesus Christ revealing to you information about the presence or non-presence of spirits (including both holy spirit or demons), and some times including the identity of demons present, whether or not you may cast them out, and providing the power to do it. Prophecy is speaking, writing, or otherwise communicating a message from God to a person or persons. Speaking in tongues is speaking a language of men or angels that you do not understand, which is given to you by the Lord Jesus Christ. Interpretation of tongues is giving the sum and substance, in your own language, of what you have just spoken in tongues. As we study these manifestations and understand what they are and how they enable each Christian to walk in spiritual power, it will be clear that every Christian can utilize all of them. The prophets of old utilized all of them but the two that God hid in Himself for the Administration of Grace—speaking in tongues and the interpretation of tongues. If the prophets who had holy spirit upon them by measure utilized seven manifestations to walk powerfully before God, then surely God has not done less for us who have been filled and sealed with the gift of holy spirit. It is very important to realize that when the Bible says “manifestation of the spirit” it means exactly that—these are evidences of holy spirit, not natural abilities that God has given to the person. They are the presence of holy spirit being made visible. We make this point because some people treat these manifestations as if they were talents that some people have, with no specific connection to the gift of holy spirit they received when they were saved. It is true that God does give different people talents. Some people sing well; some people are very athletic; some are very intelligent; some people are great artists, etc. These are all God-given talents, but they are not manifestations of holy spirit. We will examine the manifestations in the order and groups that they are presented to us in the Word of God. We will cover the two “revelation” manifestations together, because they are the first group of manifestations God mentions. They often work seamlessly together, with a single revelation from God consisting of both a message of knowledge and a message of wisdom. We call these the “revelation” manifestations because they deal with God or the Lord Jesus “revealing” something. We translate these manifestations as a “message” because the Greek word logos means an intelligible communication. The first definition of logos in Thayer’s Greek Lexicon is “a word, yet not in the grammatical sense (equivalent to vocabulum, the mere name of an object), but language, vox, i.e., a word which, uttered by the living voice, embodies a conception or idea.” The NIV uses “message,” and other versions, such as the RSV, NRSV, and NJB, use “utterance,” which would be fine as long as it is understood that it is the Lord who “utters” the message to the person and not that the person speaks a message of wisdom to someone else. The translation “message” communicates accurately exactly what the Lord gives by revelation: a message. The message may come as an audible voice, as a picture or vision, as a physical sensation, or even as a firm realization, an inner knowing. The King James Version says “word of wisdom” and “word of knowledge” and so those terms are widely used, and “word” is used for “message” in Christian jargon. Nevertheless, it could be misleading to a new Bible student who might think of revelation as “words,” especially because in our experience the majority of the revelation any person receives is not a “word” and not even by “words,” but much more often by an impression or picture. The prophets had holy spirit upon them, which is why they could hear from God and then powerfully act on what He said, and why they were so revered in their culture. It is possible for God to speak to people audibly, and not via the holy spirit upon or in them, but this is rare. When God wanted to communicate to people, He usually did so via holy spirit. That is why all through the Old Testament and the Gospels, when God wanted a person to prophesy or, like Joseph, to be a wise ruler, He put holy spirit on him. Today many Christians realize that it is possible to hear from God, and there are a number of books available on the subject by popular preachers. It is a great blessing that today, in the Administration of Grace, each and every Christian can hear from God and the Lord Jesus Christ. When we speak of revelation from God, a message of knowledge or wisdom, we are speaking of God or the Lord Jesus giving direct revelation to the person via holy spirit. Sometimes people point out that God “speaks” via other people’s advice, or nature, etc. God can “speak” to us that way, but that kind of communication from God is not a manifestation of holy spirit. Furthermore, a message of wisdom or knowledge is the Lord giving information to the believer, not the believer giving it to others. The Living Bible, for example, calls “a message of wisdom,” “…the ability to give wise advice…” Many people, saved and unsaved, give wise advice. That is not a manifestation of holy spirit. The manifestation of a message of wisdom occurs when God gives a Christian a message about what to do in a given situation via the gift of holy spirit. As we saw from its definition above, the manifestation of a message of knowledge is when God or the Lord Jesus Christ gives a believer information about something. It may be only a little bit of information, but it is knowledge nevertheless. A good example would be Joseph interpreting Pharaoh’s dream (Gen. 41:25-27). God gave Joseph knowledge about the meaning of the dream, which was that there would be seven years of plenty, then seven years of famine. That revelation is a message of knowledge because it only gives information, the facts of the case. When God gives someone a message of knowledge, He may or may not need to give a message of wisdom so the person will know what to do. For example, if a person has lost his car keys, all God has to do is let the person know where they are, He does not have to give a message of wisdom and say, “Go get them.” The person will do that without having to have a message of wisdom. Often, however, God will give a message of wisdom when He gives a message of knowledge. What if God had told Joseph about the years of plenty and the years of famine, but then never said what to do about it? The best Joseph could have done in that case would have been to pick a reasonable solution. However, God did give Joseph a message of wisdom, and Joseph told Pharaoh to store up twenty percent of the harvest during the plenteous years for the upcoming famine years (Gen. 41:33-36). When God gives a person direction, and tells him what to do, then it is “a message of wisdom.” It is important to realize and keep in mind that a message of knowledge and a message of wisdom are manifestations of holy spirit, and are not part of the natural human mind. They work together with the human mind, but they are separate from it. They are not superior knowledge, insight, awareness, or wisdom, which comes from the ability of the mind. Many unsaved people have great knowledge and wisdom, but these are not manifestations of holy spirit. Neither is it giving knowledge or wise advice to someone else, for many unsaved people give wise counsel to others. A message of knowledge and a message of wisdom are God “speaking” to us to guide and help us. It is inconceivable that He would not do that for each and every Christian. Surely He would not give guidance to one Christian and not to another. Every Christian can, and needs to, manifest holy spirit in these two ways to live a rich and successful Christian life. No doubt most Christians have heard from God via the manifestations without even realizing it. Although there are times when God gives a message of knowledge or wisdom in such a clear and powerful way that it cannot be missed, usually God speaks in a “gentle whisper” or “a still small voice” (1 Kings 19:12-NIV, KJV). An example of the Lord giving a very clear and powerful message of knowledge and wisdom was when the Lord wanted Peter to go to the Gentiles and present the Christian message to them. The Lord gave Peter a vision and audible revelation (Acts 10:11-13). However, in our experience, the whisper of God can be so gentle, so quiet, that often we cannot distinguish it from our own thoughts. This is especially true in these modern times when there is probably music or television in the background, and we are so busy and distracted that we are not really paying attention to Him. That is a major reason why the definition of a message of knowledge and a message of wisdom is “God or the Lord Jesus Christ providing to you” information or direction. The Lord “provides” the information or direction, but sometimes we do not recognize it for what it is. Many times it is only after the fact that we recognize that the “thought” we had was actually revelation from the Lord. Sometimes it is because of the timing of a thought or idea that we come to recognize it as revelation. Many Christians have the experience of doing something that turns out to be at “just the right time.” A believer may “get the idea” to call a friend that he has not called in a long time, only to find out when he is on the phone that the timing of the call was so godly that the “idea” had to have come from the Lord. A person may “feel an urge” to stop by someone’s house when he is on his way home from work, only to find that the timing of the visit was so perfect that the “urge” had to be revelation. Although sometimes these things happen by coincidence, a Christian endeavoring to walk with God and bless people will recognize them happening too frequently for that to always be the case. Often he will be able to think back to the “idea” or the “urge” and begin to recognize that it was somehow different from a “normal thought,” even though he did not recognize that at the time. In the above examples the Lord gave the revelation at just the right time, and the effect of the believer acting on the revelation he received was that people were helped and blessed. This is a good example of how the manifestations work for the “common good” (1 Cor. 12:7). It is often when there is a tangible blessing in the Body of Christ that people recognize that the Lord is at work in those Christians who walk by the power of holy spirit. Revelation from God or the Lord Jesus rarely comes like a flash of lightning and a crash of thunder, so very different from our own thoughts that we cannot miss it. Usually the Lord is working to help us do what we are already doing. Thus revelation sometimes makes us aware of something that we already know, jogging our memory or “connecting the dots” for us. A good example of that is when Paul stood on trial before the Sanhedrin. Paul had been a Pharisee (Phil. 3:5), and was very aware of the tension between the Pharisees and Sadducees, who were both vying for control of the religious system in Israel. As he was brought before them he could have been in serious trouble. They hated him, and the Romans dealt harshly with troublemakers. However, just at the right time, Paul “perceived” (Acts 23:6-KJV) that part of the Sanhedrin was Pharisees and part was Sadducees, and he cried out that he was a Pharisee and on trial over the issue of the resurrection of the dead. The counsel broke into pandemonium, and Paul was taken from there by the Romans who feared he would be hurt. That Paul received revelation is quite clear from the scope of Scripture. He knew very well that part of the Sanhedrin was Pharisees and part was Sadducees, and he knew the issues over which they were divided. Therefore it would make no sense to say that he “perceived” or “noticed” (NRSV) it as if he did not already know it. He knew it, but it had not occurred to him to use their division to save himself. The Lord provided the insight for Paul, and it may have saved his life. While it is important that we do not become prideful or “spooky spiritual” and attribute all our thoughts and ideas to God, there are times when we have an “Aha” moment, or a “gut feeling,” that is from God and not from our own mind. The holy spirit sealed inside of us is part of our very nature, and therefore God can communicate through it seamlessly and effortlessly to our minds. We have now discussed the revelation manifestations, a message of knowledge and a message of wisdom, and seen how they work in the lives of men and women of God. What God did for the people who had holy spirit in the Old Testament He does for Christians, because He knows we need His help and guidance to be successful in life and accomplish what He would have us accomplish. Each and every Christian should strive to live a holy life and do the work God has for Him, and then expect to receive messages of knowledge and wisdom to help and bless him. One of the great benefits of a message of knowledge or of wisdom is that it builds our faith. It is a powerful faith-building experience to hear from heaven, and we need faith in order to accomplish that which the Lord asks us to do. It is vital to understand that “belief in something for which there is no proof” is far from the biblical definition of “faith.” The biblical definition of faith is “trust,” and we trust things only after they have been proven to us. Jesus never asked anyone to believe he was the Messiah without proof. He healed the sick, raised the dead, and did miracles, such as healing the man born blind (something that had never been done in the history of the world), and he asked people to believe the miracles that he did (John 10:38). All of us have “faith” (trust) in a large number of things. In fact, ordinary life would be impossible without trust. A person would not sit down if he did not trust the chair would hold him. People plan their entire evening based upon faith (trust) in a recorded announcement by a total stranger as to what time the movie they want to see starts. God asks us to trust that Jesus has been raised from the dead because the Bible, history, and life give plenty of evidence for it. In contrast to ordinary faith, the manifestation of faith is necessary to accomplish the special tasks that God, by revelation, asks us to do. For example, Jesus said that a person with faith could tell a mountain to be cast into the ocean and it would be done (Mark 11:23). Moses brought water out of a rock by the manifestation of faith (Exod. 17:5 and 6), Gideon defeated the Midianites by the manifestation of faith (Judg. 6:16), Elijah multiplied the oil and bread by the manifestation of faith (1 Kings 17:14-16), and the other great miracles of the Bible were done by the manifestation of faith. When it comes to miracles and gifts of healings, we need the manifestation of faith because we cannot heal the sick or do miracles by our human power. God must give us a message of knowledge and a message of wisdom, letting us know that it is His will for us to heal someone or do a miracle, and then we must have the faith to do it. Every Christian needs to utilize the manifestation of faith. Christ said that when people received holy spirit they would receive power (Acts 1:8), but no one can operate the power of God without the faith to do so. Since every Christian needs to use the manifestation of faith to bring to pass the revelation that God gives him, every Christian has the ability to manifest faith. Thus, we see that the manifestation of faith, like a message of knowledge and a message of wisdom, is for every Christian, not just certain ones. We cover these two manifestations together because they are similar in many ways. The “gifts [plural] of healings [plural]” is so called because God does multiple healings, and each of them is a gift, done out of His grace or mercy. Gifts of healings and working of miracles are manifestations of holy spirit because it takes a believer to do them by the power of God that he has been given. It is very important to realize that it is people, empowered by holy spirit within, who do healings and miracles. On rare occasions God heals or does a miracle without human agency, but that is not “the manifestation” of gifts of healings or miracles because the gift of holy spirit inside a Christian was not employed. To do a healing or miracle, several manifestations come into action. First, the person needs a message of knowledge and/or a message of wisdom to know what the situation is and what to do about it. Second, he needs the manifestation of faith to bring to pass the healing or miracle. Third, he must represent Christ on earth and, via the power of God, bring to pass the miracle as God supplies the energy for it. Notice how Peter raised Tabitha. Acts 9:40 Peter sent them all out of the room; then he got down on his knees and prayed. Turning toward the dead woman, he said, “Tabitha, get up.” She opened her eyes, and seeing Peter she sat up. Peter spoke the miracle into being. First, Peter prayed. Then, when he had revelation from the Lord to go ahead, he raised her from the dead by the power of God. Once Peter received the revelation to raise Tabitha, he performed the miracle. We believe that there would be more miracles and healings in Christendom today if Christians would step out in faith and do what the Lord tells them to do. Too often we are waiting for God to do what He has given us the spiritual power to do. It is not our intention to demean the power of prayer in any way. Christians are commanded to pray, and should do so as much as possible. However, when God or the Lord Jesus gives us the revelation to do a healing or miracle, that is not the time to pray, it is the time to step out in faith and boldly do the miracle. If the miracle or healing takes time, the one receiving the revelation must stay in faith and prayer to see it accomplished. The book of Exodus has a great example showing that it is our choice to use the spiritual power inside us. God told Moses to take the Israelites out of Egypt. By the time they reached the sea, Pharaoh’s army was close on their heels, and the people were terrified. Exodus 14:13-16 (13) Moses answered the people, “Do not be afraid. Stand firm and you will see the deliverance the LORD will bring you today. The Egyptians you see today you will never see again. (14) The LORD will fight for you; you need only to be still.” (15) Then the LORD said to Moses, “Why are you crying out to me? Tell the Israelites to move on. (16) Raise your staff and stretch out your hand over the sea to divide the water so that the Israelites can go through the sea on dry ground. Once God gave the revelation of what to do, it was Moses’ turn to act, using the power God had given him. Moses utilized the manifestation of faith, and performed the miracle of splitting the sea. Had Moses not had faith to raise his staff and do the miracle, Israel would not have escaped from the Egyptians. Likewise, we Christians must recognize the power we have, and then step out and use that power. Jesus’ apostles and disciples had holy spirit upon them (John 14:17), which is why he could send them out to heal the sick, raise the dead, and cast out demons (Matt. 10:8; Luke 10:9). Furthermore, Jesus said that when people have holy spirit, they have power (Acts 1:8). It is clear that since every Christian has the gift of holy spirit, then every Christian has the power to do healings and miracles (Mark 16:17 and 18; John 14:12), just as the disciples of Christ and the prophets of old did. We need to increase our faith and step forth boldly to do what the Lord directs us to do. The manifestations of gifts of healings and working of miracles are often interwoven. There are certainly miracles that are not healings, such as when Moses parted the sea so the Israelites could escape Egypt. Also, there are healings that are not miracles, when, although the natural power of the body to heal itself is augmented by the healing power of God, the healing is not instantaneous. However, there are many miracles of healing in the Bible, such as the instantaneous healing of Bartimaeus, who was blind (Mark 10:46-52). Also, casting out a demon can be a miracle (Mark 9:39). The manifestation of prophecy is speaking, writing, or otherwise communicating a message from God to another person or persons. God or the Lord Jesus gives the Christian a message of knowledge or a message of wisdom via the holy spirit born inside him, and when he gives that message to someone else it is prophecy. The revelation that is spoken as prophecy can come in the moment, coming almost word by word as the speaker says them, something we call “inspirational prophecy.” It can also come as a complete revelation given to the speaker before it is spoken as prophecy, and it can come as a combination, with some revelation coming beforehand and some coming as the prophecy is spoken. In the Old Testament, when a person had holy spirit, he or she almost always prophesied. That is why Joel said that when holy spirit was poured out on all believers, they would prophesy (Joel 2:28), and why Peter, in his teaching on the Day of Pentecost, referenced Joel. Acts 2:17b and 18 (17b) …I [God] will pour out my Spirit [spirit] on all people. Your sons and daughters will prophesy, your young men will see visions, your old men will dream dreams. (18) Even on my servants, both men and women, I will pour out my Spirit [spirit] in those days, and they will prophesy. God says His servants will prophesy, so there should be little argument about it. Some Bible teachers have placed prophecy in the “worship” group of manifestations, but prophecy is not worship, it is speaking a message from God to people. It is used in a worship service, yes, but that does not make it worship. At any given Christian service all the manifestations may come into play, depending on the needs of the people. Many Christians do not prophesy, not because they do not have the spiritual ability. The presence of holy spirit inside a Christian gives him the ability to prophesy. If a Christian does not prophesy, either he has not been sufficiently instructed, or he does not have the faith to step out on what he has been given, or he does not want to prophesy. 1 Corinthians 14:24 states that the whole church can prophesy, and 1 Corinthians 14:39 (KJV) says “covet to prophesy.” There is a reason why each Christian should covet to prophesy. Bringing God’s messages to His people is not only a tremendous privilege, it is essential for the wellbeing of the Church. A study of the Bible, especially the Old Testament, reveals how valuable the prophets were in the spiritual wholeness of the people of Israel. Prophecy is not only about speaking about the future. Not only can every Christian prophesy, as the Scripture says, but we should want to. That every believer can prophesy gives us more conclusive evidence that each believer can manifest all nine manifestations. The manifestation of discerning of spirits is necessary if men and women of God are going to deal effectively with the spiritual realities of this fallen world. There are many “spirits” in this world, including angels and the gift of holy spirit. Nevertheless, because of the spiritual battle that rages around all of us, the most important aspect of discerning of spirits is dealing with the demonic forces of this world. The Greek word translated “discerning” (diakrisis) has several meanings. It can mean a “distinguishing” or “differentiation.” Also, it can mean to quarrel. One of the definitions in Liddell and Scott’s Greek Lexicon is “decision by battle, quarrel, dispute.” Thus diakrisis can be much more than just “discerning,” it has the overtones of quarreling or fighting. Since “discerning of spirits” is a total package of recognizing “spirits” and dealing with them, God places it in the “power” group of manifestations. The manifestation of discerning of spirits is interwoven with the other manifestations. For example, a believer manifesting discerning of spirits may be simultaneously aware of the presence of the demon, know what to do about the situation, and begin to command it to come out of the person. Receiving the information about the demon and knowing what to do is similar to and interwoven with a message of knowledge and a message of wisdom, while the casting out the demon can be in the category of a miracle (Mark 9:38 and 39), even as a healing can be a miracle (Acts 4:16). Every Christian will encounter demons, whether he recognizes them or not. What a great blessing and comfort to know that God has equipped each of us to deal with any demon that comes against us. Ephesians 6:12, which says we wrestle with demonic powers, is written to every Christian. Therefore, every Christian can manifest discerning of spirits. Speaking in tongues is a Christian speaking a language of men or angels that he does not understand, which is given to him by the Lord Jesus Christ. It is one of the great blessings that God has given to the Christian Church, and He desires that every Christian speak in tongues. The fact that God says He wants each Christian to speak in tongues should end the discussion about each person getting only one “gift” of holy spirit. If each of us can speak in tongues, then that would be the one manifestation we all would get, and there would be no need to list the other eight. This verse makes it clear that each of us can manifest holy spirit in more than one way. The interpretation of tongues is interpreting, or giving the sum and substance, in one’s own language, that which he has just spoken in tongues. The interpretation of tongues, like speaking in tongues itself, is given by the Lord. No one understands what he is saying in a tongue, so no one could give an interpretation of what he is saying. The interpretation comes from the Lord Jesus Christ, just as the tongue does. The manifestation of interpretation of tongues works just like speaking in tongues and prophecy do—the words come from the Lord Jesus Christ to the individual via the gift of holy spirit inside him. When a person speaks in tongues in a believer’s meeting, he should interpret so that the people in the meeting may be edified. The interpretation of tongues is to be done by the one who spoke in tongues, just as 1 Corinthians 14:5 says. Furthermore, because speaking in tongues is praise and prayer to God, the interpretation will also be to God or it can be a message to the people like prophecy and it is heard by the congregation, who are then edified by it. Each Christian has the spiritual ability to manifest all nine manifestations of holy spirit. Every Christian can talk with the Lord and receive revelation, every Christian can and should have faith and do some of the works of Jesus, every Christian should enter into the spiritual battle and deal with demons, every Christian should prophesy, speak in tongues, and interpret. It is by manifesting holy spirit that Christians can walk in the power that Jesus Christ gave to the Church. We must trust God to boldly manifest holy spirit in our daily lives. In the previous section, we spoke over and over about the “manifestations” of holy spirit. At this point we want to once again make the point that we Christians should use biblical words when we talk about the things of God. What’s the difference? A gift is individually given, and no one has a gift unless it was given to him. A manifestation is an evidence, a showing forth, of something that a person already has. There are spiritual gifts, which include holy spirit, God-given ministries such as that of an apostle or a prophet, and the gift of everlasting life (Rom. 6:23). But the nine manifestations are not gifts, and calling them “gifts” can have a negative effect on the quality of believers’ lives. The theology of many Christians, however, reduces the difference between “gifts” and “manifestations” to a non-issue, which is one reason most commentaries make so little of it. If a person believes that he will be given at most only one of the manifestations (which is the most common teaching about the “gifts of the spirit”), then to him there is no difference between a gift and a manifestation. If the Swiss Army knife has only a knife blade, then there is not much difference between the gift of the knife and the manifestation of the blade. But if the Swiss Army knife has many blades and tools, there is a huge difference between the knife as a whole and just one blade. The difference between gift and manifestation becomes very clear and very important when one realizes that the one gift of holy spirit has many “manifestations,” or evidences. The major problem that occurs when the manifestations of holy spirit are thought to be “gifts” is that it causes many Christians to be spiritually passive. Instead of realizing that they can utilize the nine manifestations and walking in faith and speak in tongues, some believers wait on God, hoping that one day He will give them the “gift” of tongues. Other believers who would love to heal people wait for the power to heal. Such people are waiting for something they already have! They may even plead with and beg God, and end up disappointed with Him for not answering their prayers. Christians need to know that they have received the power of holy spirit, and that God is waiting for them to act. They must move their mouths and speak in tongues, or use their voice to prophesy, or stretch forth their hands to heal, all with faith in the power God provided. The theology of Bible translators is in large part responsible for people thinking that the manifestations of the spirit are gifts. Notice how often the word “gift,” “gifts,” or “gifted” appears in most translations of 1 Corinthians 12-14. Yet not one of these uses of “gift” is in the Greek text. It is easy to see why the average Christian thinks of prophecy and the other manifestations as “spiritual gifts.” It is difficult to read the Bible and come away with an accurate understanding of it when the translators have allowed their theology to distort the clear reading of the text. What is the Christian to do when he reads a version with “gifts” improperly inserted in the text? He can cross out “gifts” and make an accurate reading in the margin. One good thing about the King James Version, American Standard Version, and New American Standard Version is that the translators italicized many words that are not in the Hebrew or Greek text, but which they added in an attempt to clarify what a verse says. In today’s English writing words are sometimes italicized for emphasis. A Christian reading those versions needs to remember that the italicized words are not being emphasized, they were added to the original text. 1 Corinthians 12:1 (KJV) Now concerning spiritual gifts, brethren, I would not have you ignorant. 1 Corinthians 14:1 (KJV) Follow after charity, and desire spiritual gifts, but rather that ye may prophesy. 1 Corinthians 14:12 (KJV) Even so ye, forasmuch as ye are zealous of spiritual gifts, seek that ye may excel to the edifying of the church. In each of the above verses, the italics show that the word “gifts” has been added. A better translation than “spiritual gifts” is “spiritual matters” or “spiritual things,” which fits the subject of 1 Corinthians 12-14, which are about spiritual matters, including “gifts” (1 Cor. 12:4), “service” (1 Cor. 12:5), “working” (energizings) (1 Cor. 12:6), and “manifestations” (1 Cor. 12:7-10). The Greek word translated “spiritual” in 1 Corinthians 12:1 and 14:1 is pneumatikos, which is an adjective, and thus needs a noun to complete the sense of the sentence. That is why the translators have supplied the noun “gifts.” It is common for translators to try to get the sense of the context and supply a noun to complete the sense of pneumatikos. The wide variety of spiritual matters being discussed in 1 Corinthians 12-14 dictates that “matters” or “things” be supplied to complete the sense of “spiritual” in 1 Corinthians 12:1, 14:1, etc. Those chapters in 1 Corinthians are speaking about spiritual matters of many kinds, not just spiritual “gifts.” Adding the word “gifts” obscures what God had so clearly stated in the original text and causes people to be confused about the manifestations of holy spirit. In conclusion, it is important to use the word “manifestations” rather than “gifts” when referring to speaking in tongues, interpretation, prophecy, message of knowledge, etc., for a number of reasons. That is the wording that God uses, and we are always on solid ground when we use the language of the Bible. Furthermore, the word “manifestations” points to the fact that we are dealing with outward evidences of something, which in this case is the gift of holy spirit. So if speaking in tongues, etc., are manifestations of the gift, then everyone with the gift has the ability to manifest it. Are you a Christian? If so, you have holy spirit, and with it comes the power of its nine manifestations just as Christ said in Acts 1:8. This entry was posted in Bible Teachings, Inspirational Messages and tagged 9 manifestations of the holy spirit, discerning of spirits, Faith, faith healing, gift of holy spirit, gifts, gifts of healing, gifts of holy spirit, I corinthians 12 and 14, interpretation of tongues, miracles, nine gifts of the spirit, nine manifestations of holy spirit, pneumatikos, power of the holy spirit, prophecy, signs, speaking in tongues, spirtual gifts, walking in power of Jesus Christ, why speak in tongues, wonders, word of knowledge, word of wisdom, working of miracles. Bookmark the permalink.